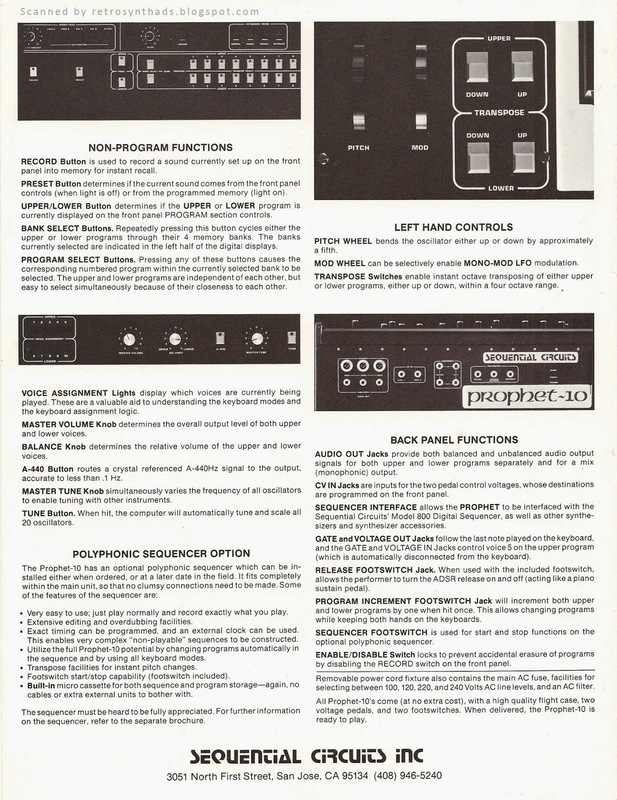 ARP family of products including Odyssey, 2600, Pro/DGX, Quadra and Omni "Free ARP Tour Jacket" full page colour advertisement from page 43 in the June 1980 issue of Contemporary Keyboard. Who doesn't love family photos. Especially when its old synthesizers. And in ARP's case, they coordinated their clothing in lovely Halloween colours - orange and black! Lookin' sharp, ARP! I love family photos so much I created a blog label just for 'em! And who doesn't love the ARP logo? It's brilliant. Now, take the logo and slap it on the back of a jacket?!?!? Gah! I want! I want! The only problem is that even if I had bought one of these keyboards back in 1980, according to the fine print in the ad I still wouldn't have got the jacket. The offer wasn't available in Canada. Booooo! Ever since Korg announced the resurrection of the ARP Odyssey, I've been dreaming about it in my sleep. But its not just about the actual keyboard I'm thinking about all the time. If Korg actually has the opportunity to use the ARP brand in its promotion of the new Odyssey (and with ARP-original Dave Friend on board it is looking likely that they do), it will be interesting to see how exactly they incorporate it into the Korg brand. About the ad - sadly, this is one of the last ARP ads to feature the Odyssey. Well, in Contemporary Keyboard anyways. 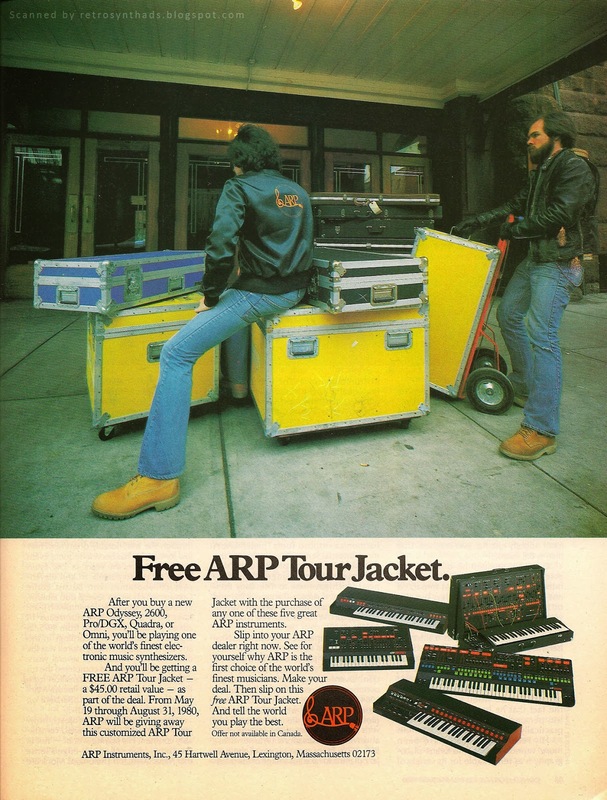 ARP continued to run ads for other products for a while, but by the beginning of 1981 they had pretty much stopped advertising in the magazine. And the company would soon be no more. This didn't go unnoticed in CK. 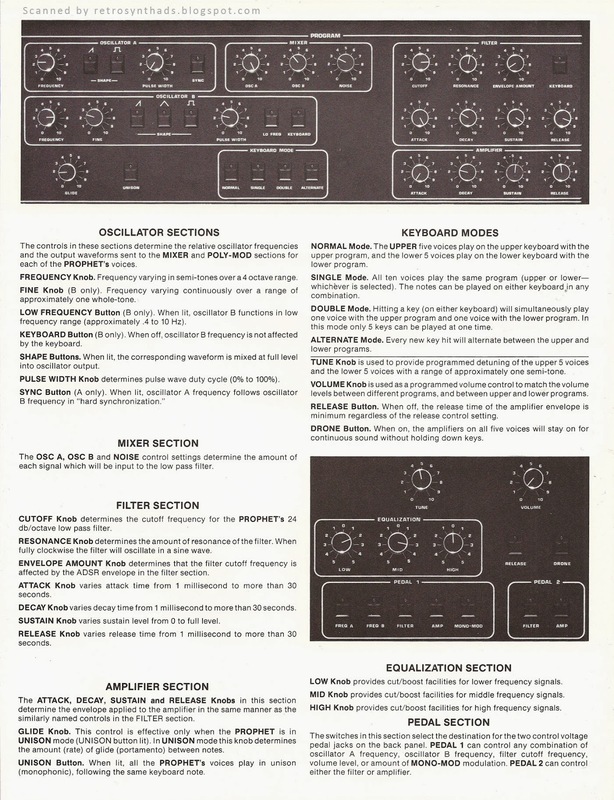 A question concerning ARP was sent in to the magazine later that year, and was answered by then-assistant editor Dominic Milano on page 64 of the "Questions" section in the December 1981 issue of Keyboard. It includes some great history on what exactly happened to ARP and it's inventory. "What has happened to ARP? Have they really gone out of business, and if so, what happens to people who need warranty work done? ARP and Mutron have indeed gone bankrupt, but CBS Musical Instruments (they own Rhodes, Fender, and Steinway) has recently purchased the ARP 4- and 16-Voice pianos as well as the still-unreleased Chroma. However, they did not purchase the rest of the ARP line and so do not want your calls about warranty repairs. Rumor has it that a company in Chicago was going to handle replacement parts and whatnot for defunct instruments, but that's only rumor so far. We'll print something more definite when we've found out what's really happening with warranty and other repairs. 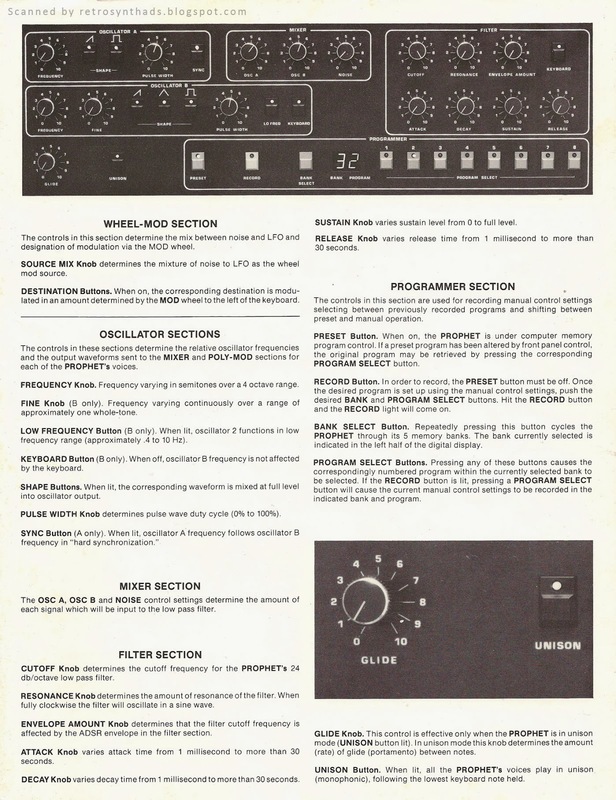 As to the availability of other ARP and Mutron products, there was an ARP inventory auction just before we went to press with this issue, and in that inventory were a number of finished products and parts which were sold to various music dealers and repair houses across the country (but centered mostly on the East Coast)." Now, if I was editor of Keyboard magazine, I would probably start thinking that the time might be right to get some of the history of ARP down in print. And that is exactly what Roger Powell, columnist, Utopia band member and former ARP employee did in the May 1982 issue of Keyboard in the "Practical Synthesis" section, in an article titled "ARP: The Early Years". Roger joined the company in 1970 when there were less than twenty employees, and their only product was the ARP 2500. His job? Like in most small companies - a lot of things. Idea man, demonstrator and salesman. There is so much history packed into this article, I can't begin to go through it all... but let me just give you a small taste. The article starts, as most historical articles do, at the beginning - when the company introduced its first product - a physical fitness training video. "[ARP] began its existence under the corporate name Tonus, Inc., in Newton Highlands, Massachusetts. The chief founder of the company whose musical products eventually were to bear his own initials, Alan R. Pearlman, was an avid exercise fan and chose the word 'tonus', which refers to a muscle's ideal state of fitness - strong, yet flexible enough to respond instantly - as the name of his new company." Bring up that tidbit of knowledge the next time you are hanging around the water cooler at work tomorrow morning. *That* is how you get the ladies! The article continues through the developmental history of the 2600 and Odyssey, with Powell adding some great commentary on his perceptions of the time period. "I remember the aura of stiff competition - we were always pushing ourselves to be more clever, to come up with some new twist that the other company hadn't thought of. Emulating any of the features found on the competitor's instruments was avoided at all cost. That is why you never saw a pitch-bend wheel on any ARP synthesizer. Likewise, Moog was very reluctant to switch to the temperature-controlled oscillator designs which ARP pioneered." With the 2600, he comments that the 2600 was developed as a revolutionary suitcase-styled "mini-electronic music studio" that was quick to set up due to a new patching scheme that included "a combination of normalled, internally wired connections which could be altered by inserting patch cords to interrupt the normal connection". "It shared many features, to be exact, with the British EMS VCS-3 (a.k.a the "Putney" synthesizer, manufactured in the London suburb of the same name). However, I can report that the 2600 was the superior instrument, both in sound and general flexibility." While Roger was out demonstrating and selling the 2600, back at the factory a stripped-down version originally called the 2700 was under development. 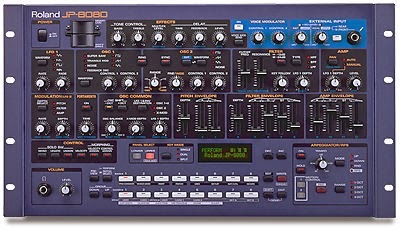 Eventually released as the Odyssey, it had a unique sound and was the only real "threat to the well-established Minimoog". He ends the article with a list of other influential ARP employees, including Jeremy Hill, a British engineer who was a rocket scientist (literally), and Phil Dodds, who played the 2500 in the now-famous scene from Close Encounters. "Certainly, the instruments will continue to be used to make wonderful music even if the company will never make new ones. If you have an old 2600 or Odyssey, it could become a collector's item some day." He probably didn't think it would be Korg who would make a new one, eh? 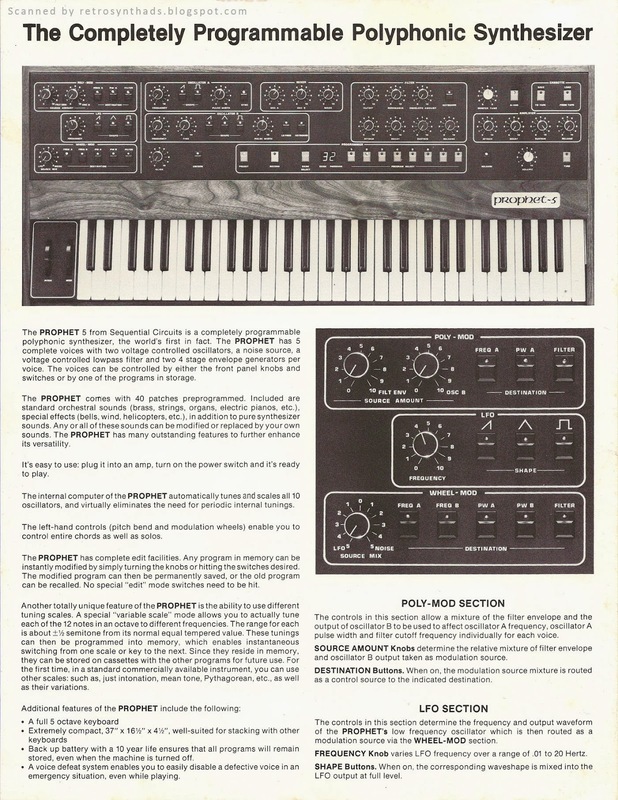 Sequential Circuits Inc. Prophet-10 "The Most Complete Keyboard Instrument Available Today" four page reference brochure (spec sheet) from approx. 1980. Wait! I know it looks familiar. You might easily mistake it for the Prophet-5 spec sheet I posted last week. But trust me, it ain't. Flip open this spec sheet and the first thing you'll find is that classic Prophet-10 photo seen in books and all over the Web. And even though this brochure is over 20 years old and that photo is in black and white, you can smell those wood side panels. 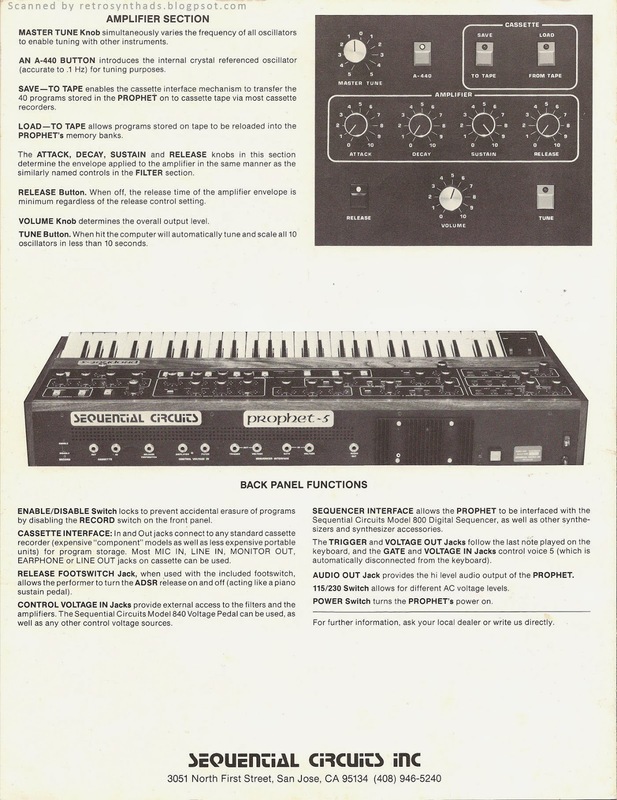 At first glance, it might look like Sequential did a bit of recycling of photos between the Prophet-5 and Prophet-10 brochures, especially that second photo on the left-inside page of the Poly-Mod/LFO/Mono-Mod sections. But closer inspection will show that they are indeed two different photos, with knobs in different positions. Where possible, some content has been recycled - the Poly-Mod, the LFO, Mixer and Filter sections in particular. But there is just so much more content to pack into the Prophet-10. That back page is especially packed with some goodies including the Polyphonic Sequencer Option section. For some reason, I was never aware of the built-in micro cassette for sequencer and program storage. I knew it had a sequencer, but internal micro cassette storage on a 1980's synth kinda blows my mind. 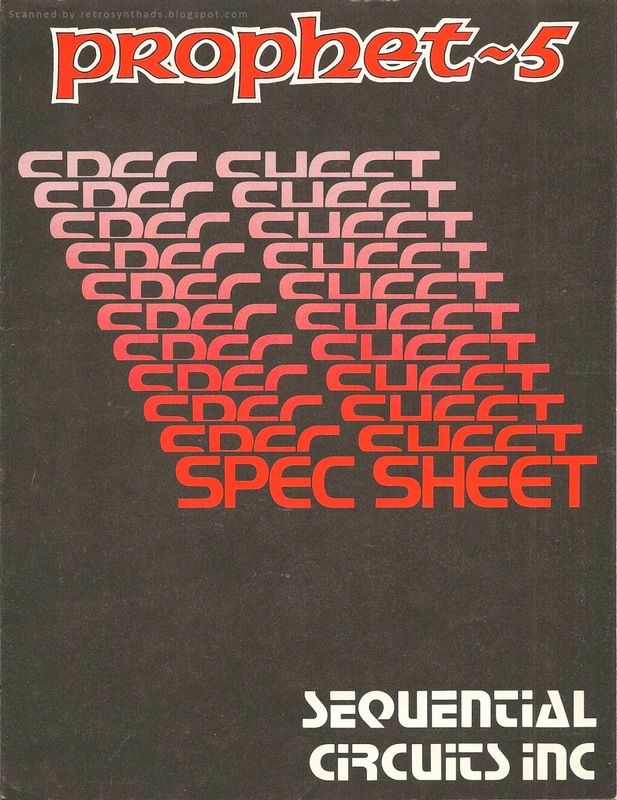 Like that Prophet-5 spec sheet, I have given this reference sheet a print date of 1980, but it could just as easily been printed as early as mid-1979 when the Prophet-10 specs appeared in Contemporary Keyboard's July 1979 spec-sheet write-up. 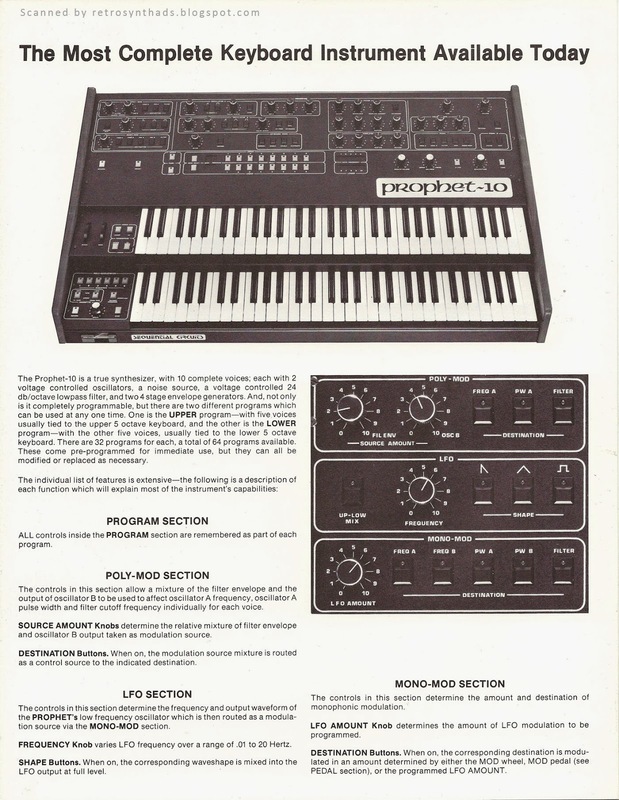 I originally included that write-up, as well as the Prophet-10 advertising timeline back in a January 2011 post for the instrument. Definitely worth a look back if you are interested. So - because I ended the Prophet-5 post with a YouTube video, I thought I would share this dual Prophet-10 video one with you. Dude is really rockin' it. 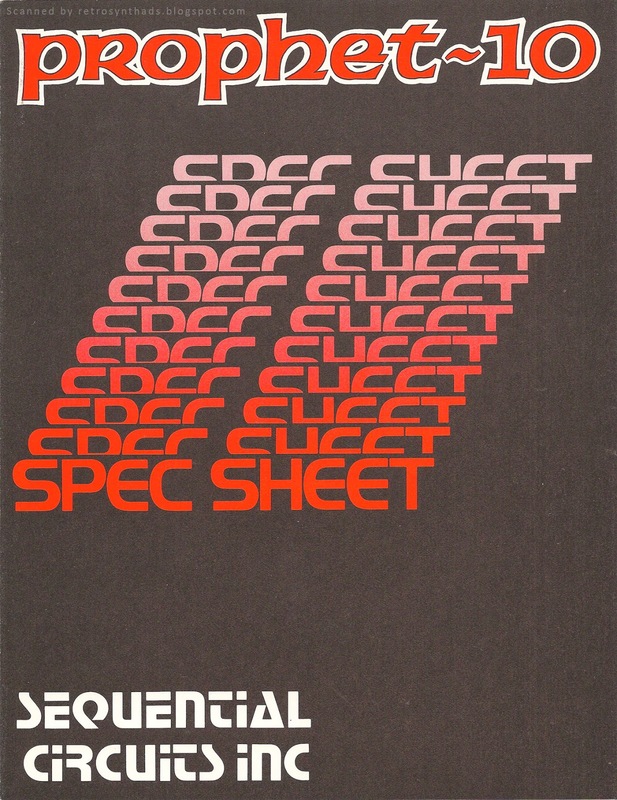 Sequential Circuits Inc. Prophet-5 "The Completely Programmable Polyphonic Synthesizer" reference brochure (spec sheet) from approx. 1980. So, re-reading that above paragraph, one might guess that my part of the world may be going through an unprecedented looooong stretch of snowy, blizzardly, winterly coldly-cold weather. And after that stupid ground hog bolted back into his hole after seeing his shadow a week or so back, I'm trying desperately to incorporate fuzzy, warm thoughts into everything I do as I eagerly await the return of the warmth of Spring. But back to the Prophet-5 - and one of the things I love most about it (and other Prophets too). Which is to say that there is something to be said for a clearly laid out front panel. Design is design is design - whether you are talking about the white space in an ad so it can be clearly read and processed, or a logically organized front panel with high-contract controls and labels that are easy to see and reach for when needed. As I get older and have less time to actually hunker down and play in the studio, I find that when I do have time to work on music I tend to reach for gear that will give me quick access to sound editing - and that usually means keyboards with knobs. And a clearly and logically laid-out panel helps keep me in the zone while i'm doing this. Yup. I'm suddenly out of the zone. I have to look around to figure out where everything is again. My brain has to take time away from music making to re-learn that front panel display. Well, enough complaining. I'm old. Although there is no date stamped anywhere on this Spec Sheet, I've dated it 1980 for the simple fact that the font panel photo includes the cassette interface found standard on the Rev. 3 Prophet-5s in the top-right corner. I did a quick search and found this great video (well... audio) of the Prophet-5's original factory program interface cassette. This is the DATA cassette, so I don't recommend listening to it unless you really like the sound of 90's dial-up modems. But, I couldn't resist posting due to the fact that the background of the video looks really really warm and sunny. Hurry Spring, hurry... faster Spring, faster.